Chiquita, a determined young hen, longs to raise a family of her own. The other barnyard animals look on sadly each day as Farmer Olson carries her eggs away. 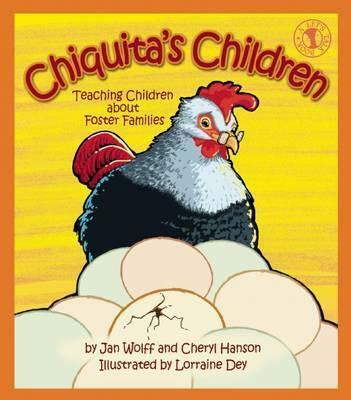 Then one day, he brings Chiquita a dozen large assorted eggs to hatch. But when her brood is born, foster mother Chiquita, has her hands full she scrabbles to meet each of their unique and individual needs. It is only through a series of mishaps and adventures that Chiquita and her children learn what it really means to be a family. Chiquita's Children: Teaching Children about Foster Families is the newest addition to the Small Horizons Let's Talk series written by teachers and mental health professionals to teach young children crisis, coping, tolerance and service skills. It facilitates discussion and provides tips about blended families and foster care. Jan Wolff is a long-time member of the Minnesota Valley Writer's Group. She has worked as a women's center peer counselor, county guardian ad litem/children's advocate and hospice volunteer as well as on various wildlife conservation issues. She lives in Bloomington, Minnesota. Cheryl Hanson, RN, LP, is a licensed psychologist who works with at-risk children and families in the Ramsey County Community Services program in St. Paul, Minnesota. She earned a Master of Arts degree in Counseling and Psychological Services from St. Mary's University and a BS in Nursing from the University of Minnesota. Cheryl lives in St. Paul with Luke, a golden retriever, and Archie and Grady, two feisty kitties. Lorraine Dey has been an illustrator and graphic designer for over 30 years. She has illustrated several children's books. Lorraine also wrote and illustrated a picture book, The Rain Forest Party, which has won a silver "Mom's Choice Award" and a gold "Gelett Burgess Award."